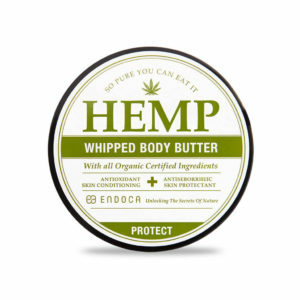 Endoca CBD Hemp Whipped Body Butter. All organic certified ingredients. A luxuriant, protective and moisturizing, hemp topical cream, supercharged with the strong antioxidant CBD, and a host of natural food grade ingredients. So pure you could eat it! Ultra moisturizing and nourishing mixture of shea butter, cocoa butter, coconut oil and hemp seed oil will leave your skin silky smooth and soft, while replenishing any moisture lost throughout your busy day. This butter will also help protect your body from damage caused by free radicals. Being rich in antioxidants make this butter a great barrier cream against the environment.